With a wide range of shower chairs designs on the market, choosing the right shower chair can be challenging. But the right information, you will know what to look for and make an informed decision in your selection process. If you are looking for the best shower chair, you are in the right place. The information we will provide in the reviews below will highlight all the important features of the shower chairs. This will help you to decide whether the chair is right for you or not. There is also a buyer’s guide that will help you to know the most important feature to look for in the selection process, and a FAQ section for some of the questions you may have. 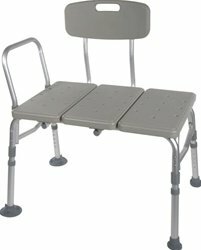 The Carousel Sliding Transfer Bench with Swivel Seat is the bestselling shower chair. One of the main advantages of this shower chair is that it is comfortable and very easy to use. You can easily move it in and out of the tab. In addition, it is a strong shower chair and you don’t need to exert much effort to slide it. The manufacturer of this product is famous for providing a range of items in nursing homes and hospitals. Besides, the transfer chair is safe, comfortable, and convenient. It is designed with an armrest, a back, and padded seat. Unlike most benches you will find on the market, Carousel Sliding Transfer Bench with Swivel Seat does not have any hard plastic and it is not slippery. Another amazing feature about this shower chair is that it is very easy to keep it clean. Putting it together is also easy. It does not have the fixed handicap bathtub seat but a swivel seat. You can raise and lock the armrest without any problem. In addition, the armrest can act as a leverage point, thus allowing you to move in and out of the shower chair easily. 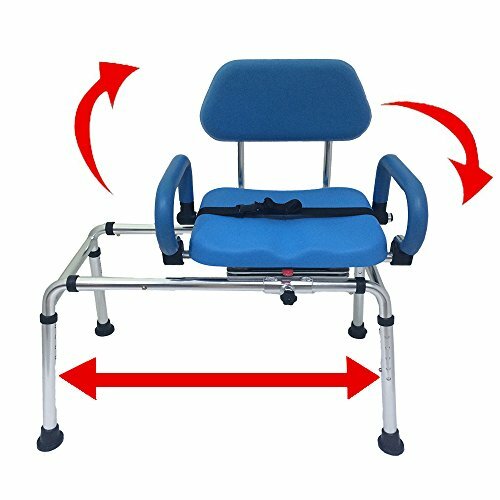 Many people who are using this shower chair have stated in the review that it is a convenient product that has helped their elderly parents to use the bathroom without any problem. Most of them stated that the shower chair is easy to assemble and worth the investment. This shower chair measures 17.5 inches by 14.75 inches, weights 17.2 pounds, has a weight capacity of 350 pounds, and is made of an aluminum frame and molded plastic with a fine finish. 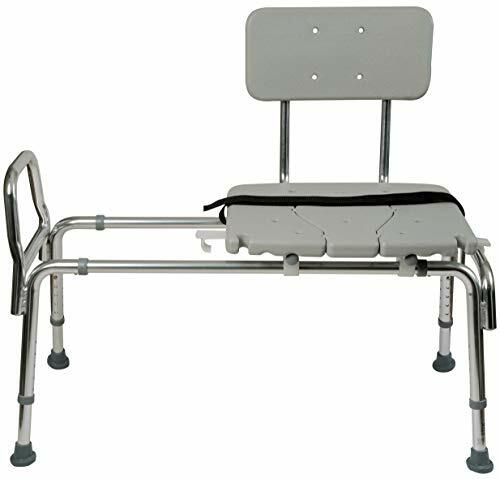 The EagleHealth Tub-Mount Swivel Sliding Bench 77762 is designed in a way that it makes it easy to get in and out of your table. For people who have a problem with mobility, this shower chair will give them more confidence when taking their bath as they won’t need any assistance. If you are disabled or a loved one is an elderly person who may find it difficult to use the bathroom alone, this shower chair will give them the freedom they are looking for. This shower chair has large legs that are designed to rest inside the far side of your tub and a set of clumps that you have to attach to the outer side of the tub. The clamps are designed in a way that they can work on nearly all tub walls. This handicap shower bench is designed in a way that it is able to install on most tubs and that’s because it features adjustable legs and frame that users can either shorten or lengthen to suit their widths and height. You don’t need any equipment or tools to install this shower bench. The Swivel Sliding Bath Transfer Bench (77662) from Eagle health supplies measures 20.5 inches by 49.8 inches by 23.2 inches and weighs 14.2 pounds. With a weight capacity of 400 pounds, this shower chair is able to accommodate most people, with a majority of those in need of them being the elderly. The product is made from aluminum and plastic, which make it long lasting. One of the most interesting things about this handicap bath chairis that it comes with a nice swiveling, flexible seat. This makes it easy for users to move while taking their shower. Unlike most shower chairs you will find on the market, this seat moves with you, instead of you sliding across it. This means you can use it with confidence knowing that you will not slide and fall when trying to move. When it comes to a potential position, this product offers a huge range as it allows you to stay in that position that helps you to maintain stability. In addition, the shower chair has a good weight limit and it’s very sturdy. This is another great shower chair you can find on the market. It is a professional grade product that you should consider adding to your collection of medical equipment. The handicapped shower chairis a non-slip adjustable shower chair that is designed to give you the comfort, safety, and durability you are looking for when taking your shower. One of the most interesting things about this shower chair is its glacier white finish. This is also the right shower chair to get if you have a large bathroom. With a weight capacity of 400 pounds, this is one of the strongest shower chairs you can find on the market today. It has a height of 16.5 inches but it can be adjusted to 21 inches. The sitting area is a generous 33 inches by 18 inches, which makes it the ideal bench for large people. You may have to assemble it, but the good thing is that it is easy and takes a very short time. Most importantly, you only need a Philips head screwdriver. In addition, the Moen Non-Slip Adjustable Transfer Bench, Glacier White (DN7105) has a grip handle to provide more support and a cup holder to store razors, toothbrushes, and soap. This is one of the most popular shower chairs for elderlyor disabled. With this item, they can use the bathroom without having to depend on other people for help or support. Made using molded plastic, this shower chair ensures stability which guarantees you that you will be safe when taking your bath. It features a backrest to give that relaxing experience at the bathroom. The shower chair measures 19.5 inches by 26 inches by 17.5 to 22 inches and weighs 10 pounds. To ensure safety during installation, this bench includes a pinch-free lever. In addition, you can easily adjust the seat according to suit your needs. The main material that has been used to make this shower chair is aluminum. This is a must-have seat for all those who are disabled. Duro Med is a leading manufacturer of innovative products on the market. The Tub Transfer Bench and Sliding Shower Chair is an item that will make it easy for you to or your family member to shower without having to seek the help of anyone. The item is designed to make the transfer from a wheelchair to the bathtub practical and easier. You don’t have to start thinking about all the methods you have been using before. This is the shower chair you have been looking for. With safety being the most important feature when it comes to shower chairs, the Tub Transfer Bench and Sliding Shower Chair by Duro med come with a safety belt to prevent slipping. It also comes with a metal handle to provide more stability and a nylon strap to prevent the seat from moving about. With regards to comfort, the shower chair comes with a blow-molded backrest designed to give you more relief. In addition, the sliding shower chaircomes with a removable cut out for height adjustable legs and easy perennial access. It is built to fit most bathtubs and with its rust-resistant frames; therefore, you don’t have to deal with issues of its getting damaged by wet surfaces. 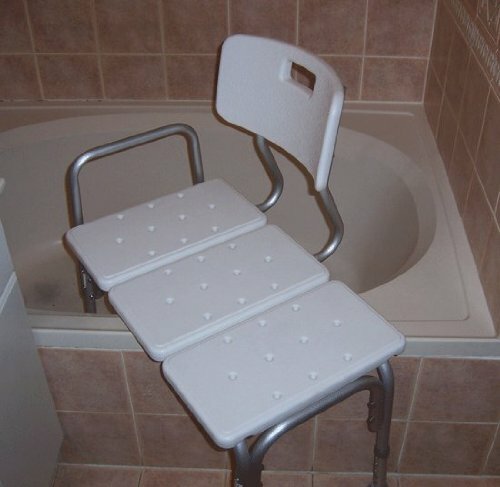 This is another great handicap shower chair. 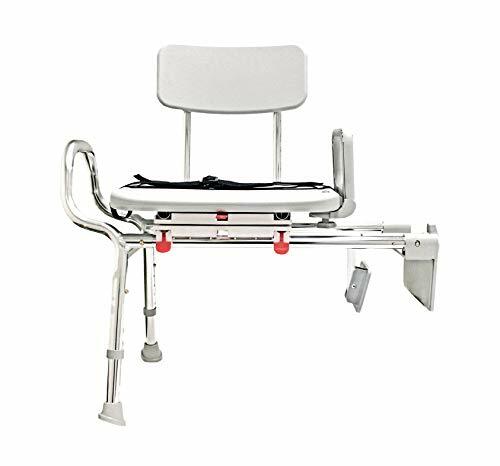 The MedMobile® Bathtub Transfer Bench / Shower Chair has a seat that measures 24 inches by 15 inches, making it easy for the disabled and elderly to transfer from the wheelchair to the shower chair. The height of the shower chair can be adjusted according to your needs. 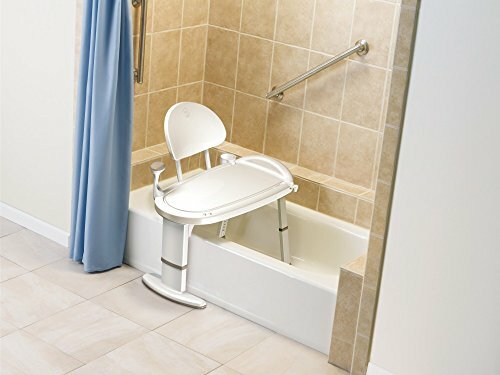 If you have a difficult time in the bathroom because you are disabled or you have a loved who is not self-sufficient, then you should consider this shower transfer bench. It has a backseat option, which can be installed if you like. Overall, the shower chair measures 29 inches by 16 inches by 25 inches. The bench can also be used for other purposes such as toring your bathroom items. This shower chair can be of great help to the people who have to rely on others to take their bath. With this shower chair, they don’t have to get help from anyone and they can take a shower on their own. Customers who have purchased this transfer bench have said that it is sturdy. Overall, this item is great to use and strong. They also said the bench is slide proof, which is good when it comes to preventing you from sliding. In order to provide the additional support needed, some shower chairs have an armrest and back support. You can choose from removal and non-removable models. You may also want to choose a shower chair that comes with compartments where you can store your toiletry. There are also models that have convenient slots design to hold a handheld shower head. The ideal shower seat should be wide and comfortable. This is important in ensuring that it all users. Most importantly, the seat should be slip resistant. Padded or contoured, most of these models have holes that drain water. You need to buy a chair that is tall enough. This is important in ensuring that your feet rest on the floor flat and your knees bent 90 degrees. It is also important to choose a model that allows you to adjust the height so that you can seat comfortably as you take your shower. You need to check the width, depth, and height of the chair before buying it. This will help in ensuring that it fits in your bathroom and also leave space for you to easily move around. Q: What are the most important things to consider when looking for the best shower chair? A: The right shower chair should be able to provide support, independence, and comfort when taking a shower. Other features are important too, but the ones we have mentioned here are the most important of all. If it does not have any of these features then it won’t serve the purpose. Q: What are the advantages of buying a showerhead? A: The main benefit that comes with using a shower chair is that it will provide support when you are taking a shower. They are very useful when it comes to helping the disabled, mobile challenged people and the elderly to conveniently use the bathroom. Q: Do I really have to get a shower chair? Q: Are shower chairs covered by insurance providers? Q: How do I use a shower chair? Q: Do I have to clean the shower chair? A: Like other items in your bathroom, you can use mild soap and water to clean the shower chair. But don’t use an abrasive. There are many advantages that come with using a shower bench, but the most important of all is keeping you safe. When you buy a high-quality bench, you can be sure that you have taken the right step towards ensuring safety and taking care of your health or that of a loved one. These are the best selling shower chairs you can find online and that’s because of the many great features they present. 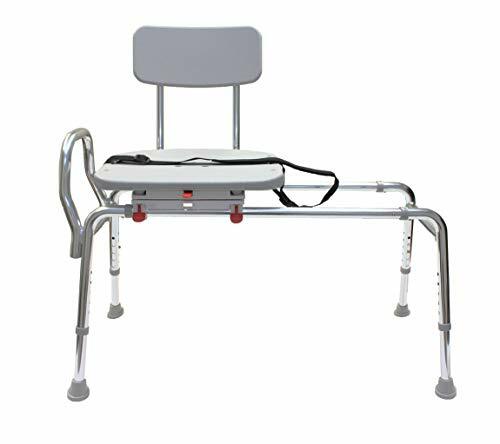 By using the best shower bench, you are keeping yourself safe and preventing unnecessary medical expenses that may occur when you use the wrong shower chair. Look at the pros and cons of all the products listed here and compared them to help you make the right pick that will suit you or a loved one. We hope that with this information, you will make an informed decision. Good luck!